To continue raising facial pain awareness throughout the month of October, Facial Pain Awareness Month is launching the First Annual Teal Pumpkin Contest on Facebook! Below are submission requirements, prize details, contest rules and a few tips for decorating your pumpkin. The Teal Pumpkin Contest will begin on Monday, October 16, 2017 at 11:00 a.m. (EST) and will conclude on Monday, October 30, 2017, at 6pm (EST). To submit your teal pumpkin, send a photo of yourself with your teal pumpkin along with your facial pain diagnosis(es) to Susan Dawson via Facebook Messenger. Photo submissions will be posted to the Facial Pain Awareness Month Facebook Page in an Album titled Teal Pumpkin Contest. Once photos are posted, invite your friends, family, neighbors, co-workers, EVERYONE to the Facial Pain Awareness Month Facebook Page to vote for their favorite pumpkin! Our Facebook page is a Community page so it is not necessary to become a member to vote. To vote for your favorite pumpkin, use the Facebook Like Button to give a Like, Love or Wow! The winners of the Teal Pumpkin Contest will be announced on the Facial Pain Awareness Month Facebook Page on October 30, 2017 at 9:00pm (EST). The top vote getter will receive a “Keep Calm & Wear Teal” Facial Pain Awareness Ceramic Mug and their photo will be featured as the Facial Pain Awareness Month’s Facebook Cover Page on October 31, 2017. The two runners up will receive a Facial Pain Awareness Lapel Pin from our redbubble.com store. Only Facial Pain Warriors may enter the contest; however, you may recruit help from family members and friends! Contest is open to Warriors anywhere in the world. NO negative comments will be permitted on any photos in the Teal Pumpkin Contest Album. Such activity will result in the user being permanently blocked from the Facial Pain Awareness Month Facebook Page. Pumpkins are NOT required to be carved. 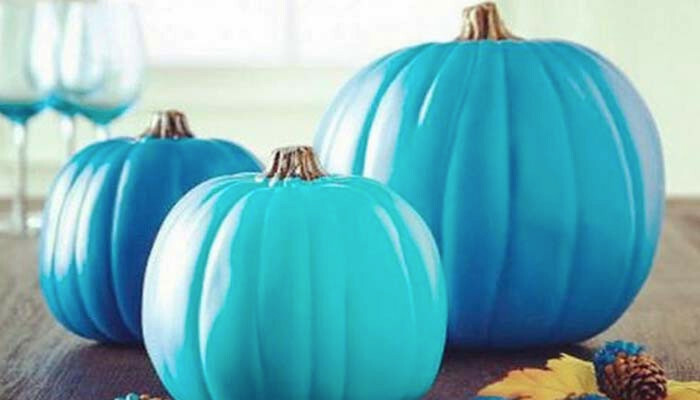 We encourage you to use your imagination and decorate your teal pumpkin however you wish. We only ask that you keep it G-Rated for “General Audiences”. The internet is packed full of ideas for pumpkin carving and decorating. A great one-stop shop for inspiration is pinterest.com. If you plan to go shopping for craft supplies don’t forget to look for coupons. Larger retail craft stores generally have weekly coupons for 40% to 50% off the price of one regularly priced item. These same retailers also offer a coupon for providing your email address to receive future coupons. Often, they will allow you to “stack” this coupon with the 40-50% off coupons. Here are a few worth checking before you head out: Joann Fabric , Michaels, and Hobby Lobby. If you forget to hunt for coupons before you leave, don’t fret. The same coupons can be found on the retailers’ mobile apps. Another great mobile app to check out for craft supplies and other retail items is RetailMeNot. Next Post Introducing Glossopharyngeal Neuralgia Awareness Day!